Bishop Renison was elected Metropolitan of the Ecclesiastical Province of Ontario. The Metropolitan is the Archbishop in a given Ecclesiastical Province. An Ecclesiastical Province is an administrative and geographic division in the Anglican Church made up of several dioceses. The Province of Ontario was created in 1912 and consists of seven Dioceses: Algoma, Huron, Moosonee, Niagara, Ontario, Ottawa, and Toronto. The province stretches from east of Kingfisher Lake in Ontario in the west, to the border of the Quebec and Montreal Dioceses in the east, to the border between Ontario and Nunavut in the north, and to Windsor, Ontario in the south. 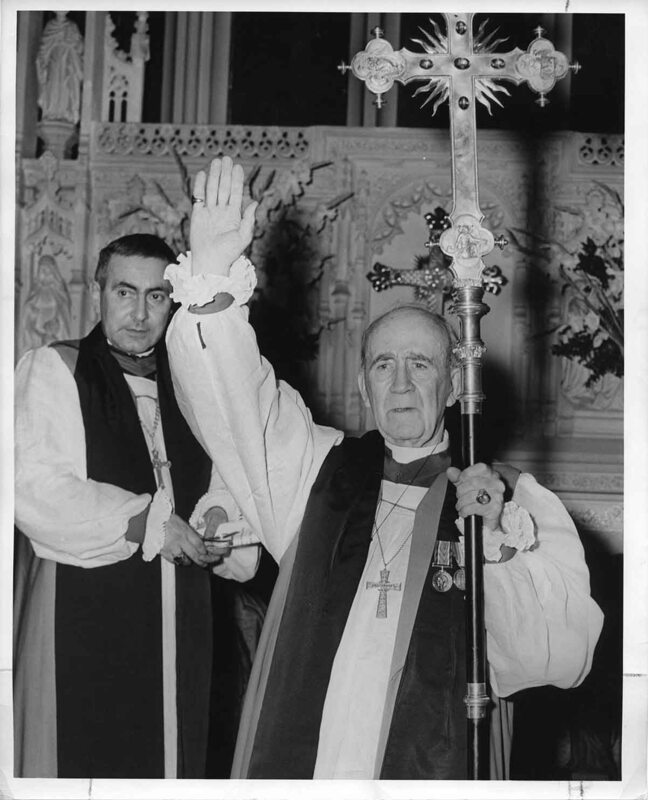 The Installation Service, installing Archbishop Renison as Metropolitan of Ontario, was on June 9th, 1952 at Christ’s Church Cathedral in Hamilton, Ontario. Archbishop Renison had a strong attachment to Hamilton, having acted as Rector of the Church of the Ascension from Easter 1912 until April 1927, when he became Rector at Christ Church in Vancouver, British Columbia. While he was Rector at the Church of the Ascension, he met and married his wife, Elizabeth Renison (nee Bristol (1914), and his two sons, Robert John Bristol (1916-1984), and George Everett Bristol (1918-1998) were born. Renison retired on September 8th, 1954 as Metropolitan of Ontario and as Archbishop of Moosonee in his 79th year. He writes that “[He] hoped he might be allowed to end [his] days there. But such a diocese needs youth, vision and drive. These are not the qualities of age and [he] was getting old.” He retired with his wife to Toronto, where he continued to write his column for the Globe and Mail until just before his death. 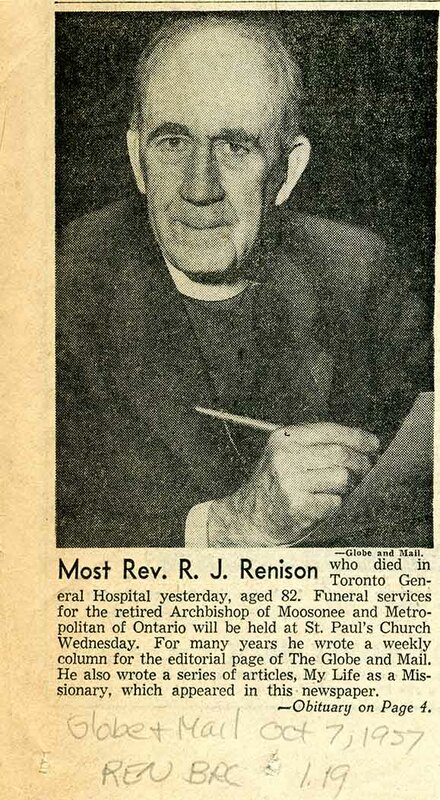 Archbishop Renison died at the Toronto General Hospital on October 6th, 1957 at the age of 82. His wife Elizabeth died in 1975, and lived to see Renison College named after him. His funeral was held on October 9th at St. Paul’s Church on Bloor St. in Toronto and over 2000 mourners attended. He continued writing his Globe and Mail column to the end. In 1959, the new Anglican college in Waterloo; Renison College was named in his honour. His family participated closely in the life of the College in the earlier years and Archbishop Renison’s son, George Renison, served as Chancellor of the College from 1986 to 1992 and Chancellor Emeritus until his death in 1998. 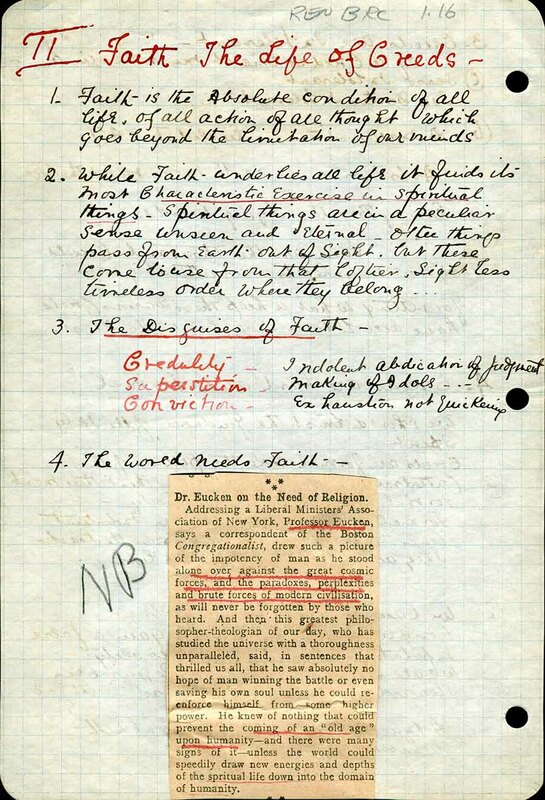 Handwritten notes for Bishop Renison's Installation Sermon as Metropolitan of Ontario on June 10, 1952, which took place at Christ’s Church Cathedral in Hamilton, ON. The Most. Rev. Robert J. Renison was installed as Metropolitan of the Ecclesiastical Province of Ontario at Christ’s Church Cathedral (Anglican) in Hamilton, Ontario on June 9th, 1952. To his left in this picture is The Rt. Rev. W.E. (Walter) Bagnall, Bishop of the Diocese of Niagara. This is a photograph of Renison’s family at his installation, including his wife and his two sons with their wives. 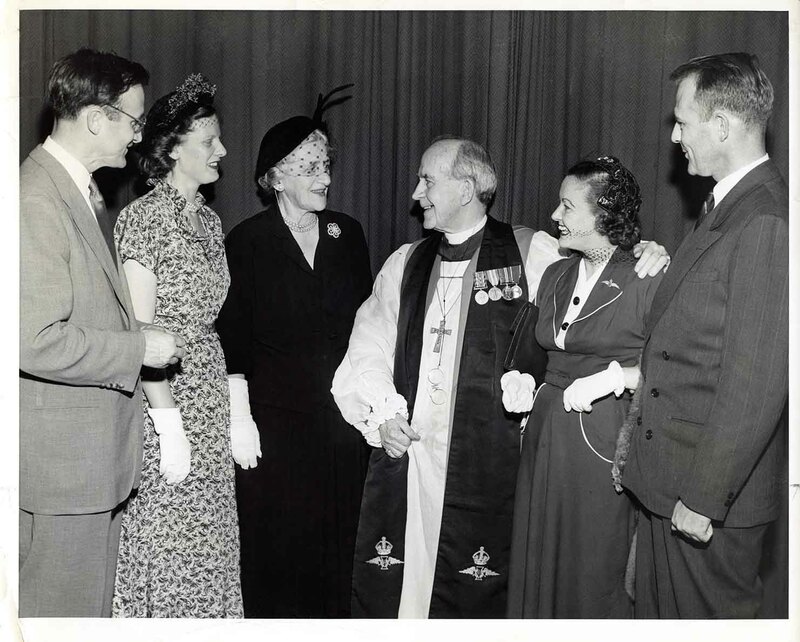 From left to right: George Everett Bristol Renison, his wife Mrs. Nancy Renison (nee Stirrett), Mrs Elizabeth Renison, The Most Reverend Robert J. Renison, Mrs. Shirley Renison (nee Sommerville), wife of Robert J. B. , and Robert J.B. Renison. 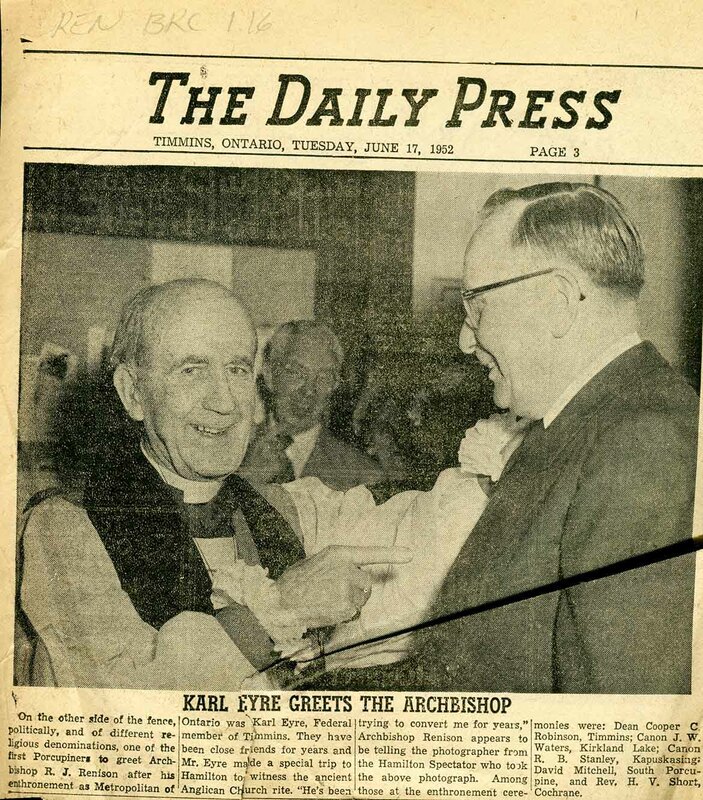 Karl Eyre, Liberal Member of Parliament for Timmins from 1949-1957, made the trip down from Timmins to attend Most Reverend Renison’s installation as Metropolitan of the Ecclesiastical Province of Ontario at Christ’s Church Cathedral in Hamilton, Ontario on July 9th, 1952. This was published in the Timmins Daily Press on June 17th, 1952. 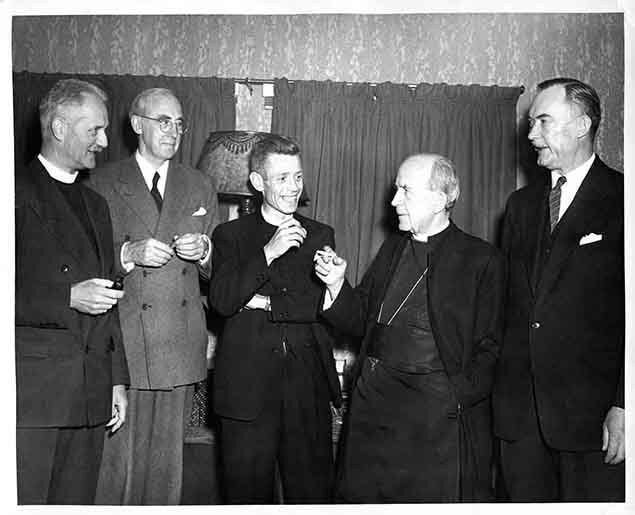 Archbishop Renison surrounded by clergy and others in a casual moment. To his left is The Rev. James A. Watton (1915-1995), future Bishop of Moosonee (1963-1979) and Metropolitan of Ontario (1973-1979). This is an announcement of The Most Reverend Robert J. Renison’s upcoming retirement published in the Toronto Daily Star on August 28th, 1954. Renison retired on September 8th, 1954 as Metropolitan of Ontario and as Archbishop of Moosonee in his 79th year. This is an appreciation of Most Reverend Renison, published in the Northland, a newsletter for the Moosonee Diocese started by Mrs. Renison while Reverend Renison was the Bishop. This was published in 1955. This is an obituary for The Most Reverend Robert J. Renison, published in the Toronto Telegram on Oct. 7th, 1957. 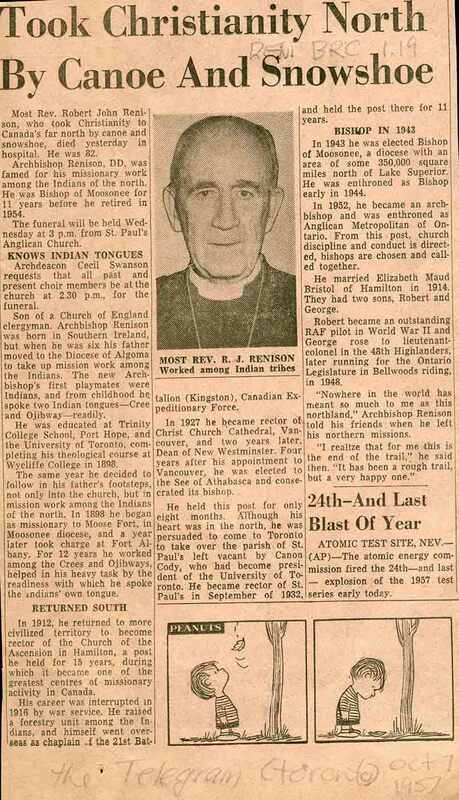 An announcement of the death of The Most Reverend Robert J. Renison, published in the Globe and Mail on October 7th 1952. He died at Toronto General Hospital on October 6th, 1952 at the age of 82. Photograph of Archbishop Renison Blessing the Congregation at the end of his Installation Service. 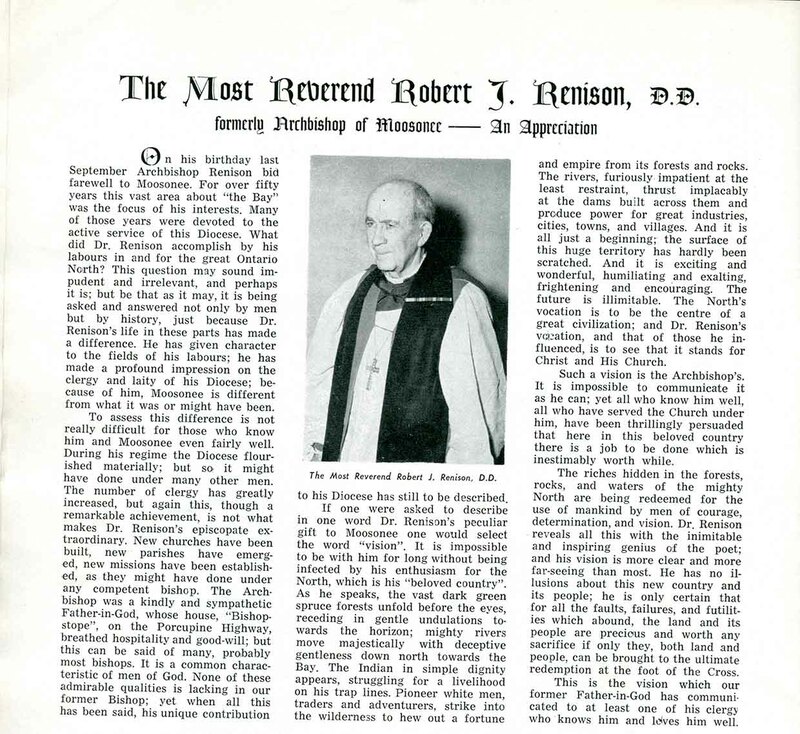 This is an image of an article about Archbishop Renison in the Northland.